Hon. Jean Philbert Nsengimana. Jean Philbert Nsengimana became Rwanda’s Minister of Youth in 2011. After merging the Ministry of Youth and Ministry of ICT, he was chosen as the Minister of Youth and Information and Communication Technology (MYICT), and was then Minister of ICT until 2017. Previously he was Country Director for Rwanda for Voxiva (2008-2010), Regional Co-ordinator for Africa of the Development Gateway Foundation (2006-2008), and as Director of the Rwanda Development Gateway (2003-2007) he pioneered and managed the development of the National Portal. Professor Tim Unwin CMG. I enjoy serving some of the poorest and most marginalised people in Africa, Asia and the Caribbean (those with disabilities, out of school youth, and women in patriarchal societies) to help them benefit from ICTs. I am also passionately committed to influencing policy through the highest possible quality of our research. My latest book, Reclaiming ICT4D, was published by OUP in 2017, and I am currently undertaking research on sexual harassment through mobile devices, especially in Pakistan, India and the Caribbean. I am also working with 21 UN agencies, led by UNESCO and UNICEF, to help them develop a UN system-wide strategy on the future of education and learning. Professor David J. Grimshaw (Visiting Professor in ICT4D, Department of Geography, and independent consultant). David was previously Head of the International Programme: New Technologies at the Schumacher Centre for Technology and Development, Practical Action and seconded as Senior Research Fellow with the Department for International Development during 2009-2011. His career has bridged academia and practice, driven by a desire to impact on the real world. His passion is to enable technology to work for all people in all societies. Dr. Elizabeth Quaglia (Information Security Group). Liz obtained her BSc in Mathematics from Universita degli Studi di Torino, her MSc in Mathematics of Cryptography and Communications from Royal Holloway, University of London (RHUL), and completed her PhD at RHUL in 2012. She has been a research intern at the IBM T.J. Watson Research Center, New York, and in the Qualcomm Security team in San Diego. Following a post-doc at the Ecole Normale Superieure, Paris, she was a visiting lecturer in the Computer Science department of the University of Cape Coast, Ghana, and from 2014 to 2016 she was Senior Researcher in the Security Team of Huawei in Paris. Her area of expertise is cryptography, with a special focus on public-key encryption. She has also worked on network security, physical-layer security and, more recently, on secure e-voting. Dr. Gwilym Eades (Department of Geography). I study and teach GIS in development contexts. My areas of interest are counter-mapping, indigenous studies, Canadian development, and northern areas. I have published two books, Maps and Memes (McGill-Queen’s University Press) and The Geography of Names (Routledge), both about aspects of development, counter-mapping, and indigeneity. Dr. G. ‘Hari’ Harindranath (Reader in Information Systems in the School of Management). Hari has a background in political economy and his research centres around the social and organisational implications of ICTs, including ICT4D and ICT in developing/transition countries. He is currently leading the work package on ‘Technology, Inequality and Migration’ for the five-year (2019-2024, £20 million), UK government funded, UKRI GCRF South-South Migration, Inequality and Development Hub led by Coventry University. This package focuses on how ICTs have alleviated or exacerbated existing inequalities in the context of South-South migration, and ways through which we can use them for positive development outcomes, particularly to reduce inequalities. Konstantinos Mersinas (Information Security Group). Konstantinos is a Lecturer in Information Security at Royal Holloway and Deputy Director of the ISG’s Distance Learning Program. Before joining academia he worked as an Information Security Consultant in parallel to a teaching career in Mathematics and Security. He actively promotes security awareness via teaching initiatives (Cybersecurity with Qufaro at Bletchley Park). His research interests are multi-disciplinary and lie in the areas of risk perception, decision-making under risk and uncertainty, and behavioural economics. Kristina Glushkova (Research and Business Development, Impact). Kristina’s background is in digital innovation, policy, business and social enterprise in the UK and internationally. She has worked on policy and research projects at Ofcom, managed financial performance at Nokia, helped launch new products at mySociety, developed digital partnerships at the Global Goals campaign, and co-founded Impact Hub Brixton and Makerhood. She currently focuses on helping great research at Royal Holloway, University of London, make a difference in government, corporate and non-profit sectors. Professor Lizzie Coles-Kemp (Information Security Group). Until 2008 Lizzie worked as an information security practitioner undertaking such roles as a compliance assessor for LRQA, Global Security Manager for the British Council and information security architect (DynaSoft AB). She has experience of working in the banking, healthcare, government, communications and utilities sectors. In 2008 she joined the ISG as a Lecturer in information governance and security management and has recently set up the Possible Futures Lab within the ISG to focus specifically on participatory research approaches to information management. She often works with marginalised and hidden communities. Professor Mark Lycett (School of Management). Mark is Professor of Information Management and his research examines the organisation, understanding and derivation of value from all types of data. His particular interest is in the use of data for situational awareness and how that can improve things like (customer) experience, service delivery, business performance, and citizen engagement. He has published in leading journals and conferences and is engaged in ongoing research with a variety of organisations. Prior to returning to education, he worked in industry, primarily in project management and consulting. Dr. Rikke Bjerg Jensen (School of Law). Rikke’s research positions itself in the intersection of security, defence and emerging media. She has undertaken extensive fieldwork within defence and security organisations as well as government departments to explore how approaches to and policies on digital practices are formulated, implemented and maintained. Dr. Sara Bernardini (Senior Lecturer, Department of Computer Science). My research interests revolve around designing and building intelligent and autonomous agent and multi-agent systems through automated decision-making techniques. In particular, I have been conducting extensive research on automated planning for temporal and metric domains, planning domain modelling languages, domain-independent search control, intelligent control and probabilistic reasoning. Dr. Akber Gardezi (Assistant Professor, Department of Computer Science, COMSATS Institute of Information Technology, Islamabad; Manager of the Inter Islamic Network on Information Technology, INIT). Akber’s PhD from the University of Sussex was on pattern recognition algorithms, and he is team lead at COMSATS for research on Detection and Recognition for Evolutionary Robotics. He is interested in a wide range of ICT4D activities in Pakistan, and is leading an initiative on advocacy, policy making and the development of novel technologies for people with disabilities. Dr. Amalia Sabiescu (Institute for Media and Creative Industries, Loughborough University London). Amalia is a communication scientist with an interdisciplinary research track at the interface between communication technology, culture, education and development studies. Her current research interests are in the fields of communication for development, social and digital inclusion of disadvantaged communities, and digital interventions in cultural and creative practice. Dr. Bushra Hassan (Assistant Professor, International Islamic University, Islamabad, Pakistan). I am a social psychologist, undertaking research within the fields of identity styles and organisational psychology. I gained my PhD from the School of Psychology at the University of Sussex, and my work in ICT4D focuses on ways through which mobile ‘phones are used in Pakistan to shape individual identity. I am currently undertaking research on women’s experiences of sexual harassment through ICTs in Pakistan , the Caribbean and India. Charlotte Smart (UK’s Foreign and Commonwealth Office, Sri Lanka). Charlotte was Digital Policy and Programmes Manager, in DFID until 2019, and now works for the UK’s FCO in Sri Lanka. Prior to joining DFID, her work included: exploring last mile internet access with consultancy Caribou Digital in Africa; implementing digital payments in India with financial consultancy MicroSave; and undertaking research into the impact of technology with the Maasai in Kenya. Charlotte holds a Master’s from the Oxford University Internet Institute (OII). Dr Chux Daniels is a Research Fellow in Science, Technology and Innovation (STI) at the Science Policy Research Unit (SPRU), University of Sussex. His research connects STI and public policies in fostering transformative change that contributes to achieving sustainable development. His areas of interests include STI, policymaking, inclusive technology and innovation, capabilities, entrepreneurship, indicators and evaluation, and development. He is a member of the African Union Commission Monitoring & Evaluation Committee on STISA-2024. His recent research, policy, and consultancy projects include more than 10 African countries, the Caribbean, United Nations ESCAP, UNCTAD, and various private sector entities such as GSMA, and KPMG. David Banes (Director David Banes Access and Inclusion Services ). David was formerly CEO, at Mada the Qatar Assistive Technology and Accessibility Center based in Doha. Throughout his career, he has been responsible for developing services to ensure that people with a disability are digitally included, and in shaping the broad policy framework required to ensure and sustain this. Much of his work is designed to build capacity, supporting an end to end approach from awareness to policy, and from production of assistive technologies to approaches to training and development. Dr. David Hollow (Lead Consultant, Jigsaw Consult). David has undertaken complex evaluations and research studies in over fifteen countries with a variety of donors, governments, INGOs and community-based organisations. He is passionate about helping organisations use evaluation and research to enhance development outcomes. He has worked in international development for ten years and has a PhD from Royal Holloway, University of London. His doctoral research focused on evaluating the impact of ICT on education in sub-Saharan Africa. Professor Diego Vázquez-Brust (University of Portsmouth). Diego has 20 years experience of working for the Argentinian government on multidisciplinary and multi-stakeholder consultancy and infrastructure projects. His research focuses on supply chain management, critical green growth, environmental protection and building sustainable futures. He was Director of the Centre for Research into Sustainability (CRIS), and Deputy Director of Research in the School of Management at Royal Holloway, University of London. University of Birmingham Business School). Endrit was formerly lecturer in entrepreneurship and innovation at the School of Management at Royal Holloway, University of London. His areas of interest are digital innovations for entrepreneurship financing, e-government in developing countries and the use of ICTs for business, sustainability or learning for development. He has published on crowdfunding, on e-government in developing countries, and was the founding editor of the ICT4D Briefings of the UNESCO Chair in ICT for Development. Jon Gregson. Jon is a development professional currently working on a range of projects as a freelance ICT4D consultant and as a tutor and author for SOAS’s postgraduate distance education programme. He has traveled extensively and lived and worked in Nepal and Kenya. His previous roles include heading up IDS’s Knowledge Service Department, and being Director of Global Networks and Communities for the University of London International Academy. Hari Krishna Neupane (IT Solution Architect at Nuance Communication Inc. and Technical Advisor at Rotary International). Hari has 15 years of experience in ICT project design, implementation and management across multiple industries and sectors. He is currently responsible for the design and implementation of Nuance’s corporate intranet portal, messaging and collaboration system and Cloud solutions for their global employees and customers. He is also working on community development projects in Nepal through Rotary International and the Society of Nepalese Engineers in UK. Lenandlar Singh (Senior Lecturer in the Department of Computer Science, University of Guyana). Len’s research focuses on learning technologies and ICTs in education, mobile learning, and the learning of computer programming by novices. He was Head of the Department of Computer Science (University of Guyana) from 2012-2016. He currently serves as Chief Examiner of Information Technology at the Caribbean Examinations Council’s CAPE Examinations. He’s also an Executive Director on the Board of Directors of the National Data Management Authority (NDMA) in Guyana. Dr. Marije Geldof (Institute of Social Studies, The Hague, Netherlands). Marije currently works part-time as project officer at the International Institute of Social Studies in the Hague and as independent consultant in the area of ICT4D and mobile health. Previously she was Country Director for D-tree International in Malawi for 4 years, developing innovative mobile phone applications for health workers. Marije holds a PhD from Royal Holloway, University of London, which explored the role of ICTs in the lives of low-literate youth in Ethiopia and Malawi. Dr. Marco Zennaro (Telecommunications/ICT4D Laboratory, The Abdus Salam International Centre for Theoretical Physics, Trieste, Italy). Marco Zennaro coordinates the Telecommunications/ICT4D Laboratory at The Abdus Salam International Centre for Theoretical Physics. He received his PhD from the KTH-Royal Institute of Technology, Stockholm, with a thesis on Wireless Sensors for Development. He is a Visiting Professor at Kobe Institute of Computing, Japan. Dr. Silvia Masiero (Lecturer in International Development, School of Business and Economics, Loughborough University). Silvia’s research focuses on the use of ICTs in socio-economic development. In particular, she studies the multiple forms of embeddedness of the IT artefact in development policy and governance, with a specific interest in its participation in the politics of anti-poverty programmes. Her current work revolves around the role of digital technologies in reshaping the politics of the Public Distribution System (PDS), the biggest food security scheme in India. Dr. P. Vigneswara Ilavarasan (PhD – IIT Kanpur; Associate Professor, Dept. of Management Studies, Indian Institute of Technology Delhi). He researches and teaches about production and consumption of ICTs, with a special focus on India and development. His current research interests focus on the growth of urban microenterprises and smartphones; broadband access in rural areas; shared economy; and social media analytics. He has been a Visiting Research Fellow at the United Nations University Computing and Society Institute (Macau), and is a recipient of the Outstanding Young Faculty Fellowship Award at IIT Delhi and the Prof. M.N. Srinivas Memorial Prize of the Indian Sociological Society. 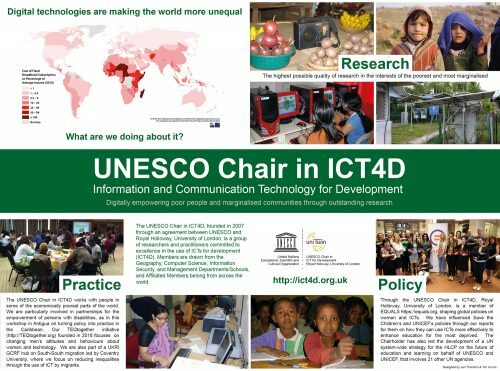 Further affiliated members are currently under consideration by the UNESCO Chair in ICT4D. If you are interested in being affiliated with the Chair, please contact the Chairholder or complete our contact form.